Since his days studying chemistry in the 60s, Monash has played base camp in the life of alumnus Dr John Parrott. He played cricket here for two decades, married his wife Mary at the Monash Chapel, and has hosted family occasions at the Staff Club. “I hope I’ll be allowed to have my funeral at Monash,” he quips. His far-sightedness in support of the technology resulted in him taking the job as CEO of start-up company Ceramic Fuel Cells Ltd in March 1993, where he helped commercialise this new form of sustainable energy production. Dr Parrott’s experience as a research chemist had given him great exposure to the tenacity required in making a new discovery. John and his family understand what it takes to develop research science. That’s why they are avid supporters of Monash University and they donate to the Faculty of Science to help future generations of students. 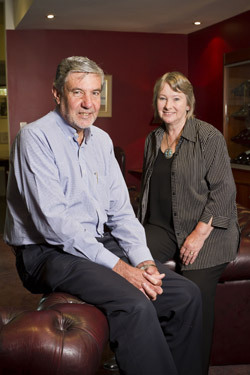 John and Mary Parrott donate towards student scholarships and have committed a bequest to science seeking to build a sustainable base of support for students. John also works as a champion helping bring his network together to support science at Monash.